Excessive Art Tattooing Studio has been providing high quality tattoos near Wangaratta since 1999, with many of our customers making the trip to our studio for our over 2 decades of experience and extremely hihg quality of work. Located in Shepparton, we pride ourselves on being the first tattoo studio in the area, offering superb quality tattoo design solutions for our local clients. Our long lasting appeal is testament to the fact, that we’re not just another little tattoo shop but experienced veterans in our field. 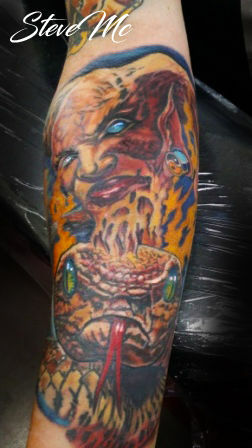 With 25 years experience, we specialise in all styles of tattoos to suit a range of preferences. 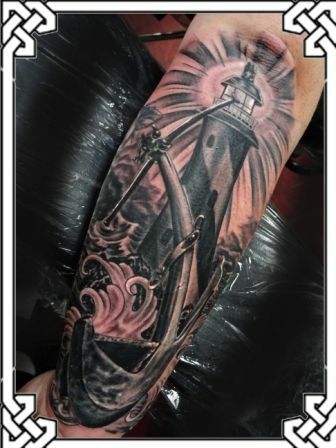 Whether you’re after a small tattoo design or something more detailed and elaborate, we are happy to discuss your ideas to create a great tattoo that you will love. Our tattoo parlor in Wangaratta is synonymous with personalised service, hygienic practices and quality design work. Why settle for second best when you can have the best. 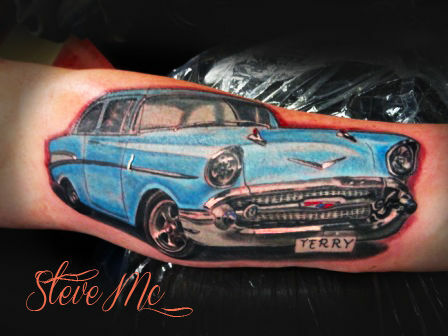 Customers also make the trip from Cobram to our tattoo shop. At Excessive Art Tattooing, we are here to ensure your experience is as amazing as we can make it, priding ourselves on our open and friendly studio atmosphere. Whether it’s your very first tattoo or a new tattoo to complement your existing body art, we’re always available to discuss your ideas and provide professional input, if needed. If you think you might not be able to handle the pain of getting a tattoo done, we can also provide you with numbing cream to help alleviate any discomfort or pain. Excessive Art Tattooing provides a number of other services such as retail treatment products; as well as tattoo and laser removal services to help you get rid of unwanted ink. No matter how big or small, modern laser technology means that scarring is limited with tattoo removal, so there’s no reason not to enquire if you’re curious. Feel free to chat to us today about all your tattoo concerns – we’re here to help. Walk-ins are always welcome and will be looked after as soon as possible. With many tattoo shops to choose from near Cobram, look no further than Excessive Art Tattooing for expert results. To make a booking, connect with us via Facebook, Instagram or Email us at excessiveart@westnet.com.au. Please note: All bookings must be confirmed by phone on (03) 5821-6215.